The most informative and popular reference charts available! 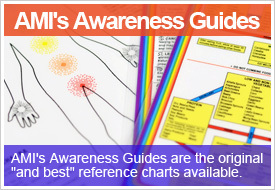 AMI's Awareness Guides are the original & best reference charts available. They cover subjects like crystals, herbs, chakras, nutrition, Ayurveda, aromatherapy, numerology, astrology, colors, and more. Lists the healing and transformational qualities of over 55 of the most popular gems and minerals. Also available in Spanish. Shows the locations of the chakras on the body in their corresponding rainbow colors. Also provides the element, functions, glands and organs, gems and minerals, foods, emotional qualities, and negative qualities associated with each chakra. The back of the Guide offers excellent techniques for activating the chakras. Also available in Spanish. Makes the art of proper food combining simple as can be. The food combining diagram is very easy to understand. Back of the Guide offers more in-depth information on the subject. This excellent Guide lists over 70 common health problems and offers the appropriate herbs and dietary suggestions to use for healing those specific conditions. Lists the main organs and parts of the physical body, suggesting their relationship to specific attitudes and emotions which can negatively affect them. Each of the 40 categories are filled with powerful and revealing insights. Offers in-depth explanations on the healing and transformational properties of an additional 49 popular gems and minerals. Lists the vitamins, minerals, and trace elements necessary for optimum health, their finest whole-food sources (no meat or dairy products listed), and how they function in and benefit body and mind. Offers the approximate dates, symbol, element, personal statement, and psychological qualities of each sign of the zodiac. All planets (including Chiron) are listed with a concise explanation of their qualities and forces. The psychological significance and healing benefit of color is a highly requested topic. This Guide provides an excellent physical, psychological and spiritual explanation of the seven rainbow colors, with black and white included as well. Offers clear instructions for four of the major numerology calculations; the personal and universal significance of the numbers 1-9 and the master numbers 11, 22, and 33. Displays a quick reference key for easy calculations. A handy, pocket-size version of our popular 8x10 size Food Combining Guide. Lists 22 of the most popular seeds, nuts and beans, and gives simple, precise instructions for transforming them into delicious and highly nutritious sprouts in just a few days.